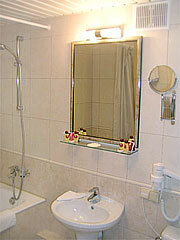 This Kiev Hotel is one of the best-known hotels in Kiev for the tourist or business traveler. The 22-floor Hotel Rus sets on a picturesque hilltop location just a few short minutes from the center of Kiev and overlooking the Olympic Stadium. The hotel transferred ownership in 2004 and continues to improve the quality of both rooms and services. You will also be happy to find a US chef in charge of the dining facilities, which makes breakfast a more familiar plate. A great place to catch up on the local conversation and to make new acquaintances is the lobby cafe bar of the Rus Hotel. This is one of the most pleasant & casual atmospheres where you will find the ever-present congregation of Romance Tour travelers that pass through the hotel. This is also the hotel of choice of the US government for official visits to the city, not to mention the rock and movie stars, sports teams, and other international celebrities. The hotel features 416 rooms mostly air-conditioned with private bath, supported by 4 dining halls and two bars, a business center, and several shops for clothing and gifts. The staff is helpful and courteous. The Rus is also the long-standing location of A Foreign Affair International Marriage Services, located in Suite 504. Located 7 minutes from Kreschatik Blvd and 38 km from the Borispol International Airport.